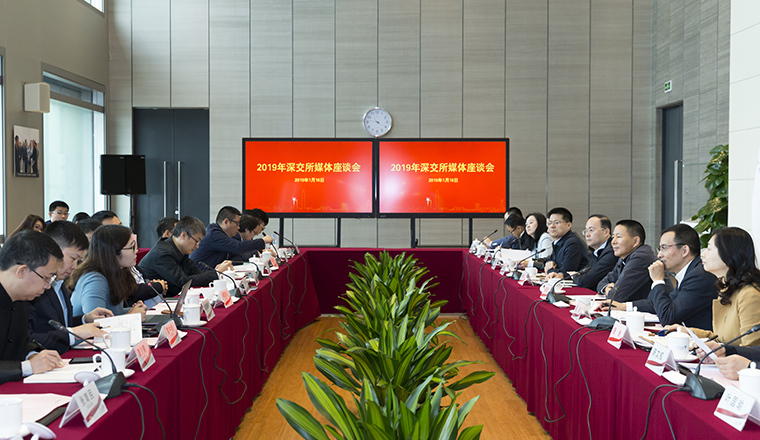 Shenzhen Stock Exchange (SZSE) held a media forum on January 16, 2019. More than 30 officers and journalists from 15 central media, professional financial media, and new media attended the forum, visited the SZSE Financial Museum, and watched an on-site listing ceremony. This is a powerful measure of SZSE to fulfill the requirements of the CSRC on strengthening the arrangement of news and public opinions in the capital market and is an important content for SZSE to improve a normalized news media communication mechanism and build a transparent exchange. SZSE President and CEO Wang Jianjun, Vice President Peng Ming and heads of relevant departments attended the forum. At the forum, an SZSE official briefed the media on the work of SZSE in 2018 and the key work arrangements in 2019, and conducted in-depth exchanges on the media concerns. Media at the meeting said that in recent years, SZSE has earnestly implemented the principles and policies of the CPC and the state, promoted its political stance, served the real economy, strengthened risk prevention and control, consolidated front-line supervision, deepened reform and innovation, standardized management operation, and strengthened news communication. Positive results have been achieved in all work. The media hope to further strengthen the exchanges and cooperation with SZSE and give full play to their professional advantages so as to better tell the story of capital market and create a favorable public opinion environment for the construction of a standardized, transparent, open, dynamic and resilient capital market. The SZSE official said that the construction of capital market and the development of SZSE cannot be separated from the active participation and strong support of the news media. They have played an important role in transmitting market information, interpreting policies and systems, monitoring market players' behaviors and building a good atmosphere of public opinion. They are the "stability valve" and "booster" for promoting the healthy development of capital market. SZSE will earnestly study and implement the spirit of General Secretary Xi Jinping's important speech at the National Conference on Communication and Ideological Work, further strengthen the work on press and public opinions, strengthen the setting of topics and initiative planning, improve diversified channels of news publicity, and make timely response to market concerns. We will continue to deepen exchanges and cooperation with the news media, enhance mutual understanding, forge consensus on development, and make concerted efforts to further enhance the dissemination and influence of press and public opinions on the exchange.